It is easy to notice the signs of a broken spring, even though this doesn’t happen very often. You can expect the motor to run as usual, but the garage door will stay in place. This is because the spring is responsible for lifting the door. The opener simply replaces the manual action you’d have to take. You just need to look up to confirm that the spring is actually broken. Disconnect the opener from the door and stay put until we come and replace the hardware component. Count on us to install a new one that will match your overhead door and can balance it properly given its size and weight. With accurate adjustment, you will enjoy smooth performance at all times. 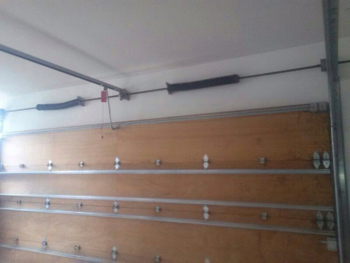 When you are getting a new garage door, you can select between the two main types of springs. Customers who hire us for the installation will get professional explanation, comparison and advice to help them make the right choice. Here are some basic facts and figures that you should know about the two types of garage door springs. The average cycle life of torsion springs is 10,000 cycles while that of extension ones is 5,000 cycles. The former can be more accurately adjusted compared to the latter. Extension springs are at greater risk of getting twisted coils because of the way in which they work (stretching and contracting). Their torsion counterparts, on the other hand, require lubrication to work well and to stay protected from extensive wearing. Why do springs need to be tested? The test is designed to check whether they balance the garage door properly. It is extremely important since it shows whether the door’s performance has to be improved. We run this type of test as part of our maintenance service. It involves lifting the door halfway open after having disconnected the opener and releasing it slowly. If it literally jumps up or drops down, the spring’s tension has to be reduced or increased respectively. You can rely on us to adjust it with maximum precision. Browse through the rest of our website to find out more and give us a call!